Linear Actuator Products Design and Customization - Venture Mfg Co.
Facilitation of linear motion in a system is achieved with ease thanks to the ingenious nature of linear actuators. Designed for efficiency, these actuators are used widely in various applications across several industries. Let us understand in brief the designing details, working mechanism, and applications of a linear actuator. A linear actuator works along a straight line in any system. That is why the most important factor while designing an actuator is its inclined plane. Any basic linear actuator design consists of a threaded lead screw. The thread is helpful in acting as a consistent ramp in order to allow minimal amount of force. This force acts along larger distances to achieve the desired movement of heavy loaded equipment. The basic function of any linear actuator design is to provide and control “push and pull” motion/ movement in a straight line in any system. Based on the power supply options, the linear actuator can either operate with the help of manual force or with electric supply. The force provided to the actuators helps in their lengthwise movement across a straight line. In certain specialized actuators, motion is converted from rotary to linear with the help of straight sections of cogged belts or roller drive chains. Certain high speed linear actuators are programmed with the help of a computer so as to implement operations with high levels of precision. Motion control in pumps, dampers, switches, etc. What makes Venture Mfg. Co. an Industrial Leader for Electric Linear Actuator Design? 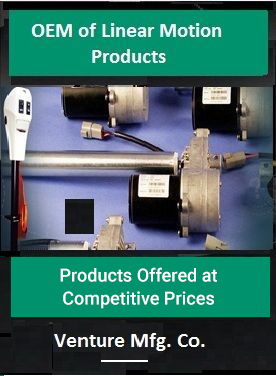 The designing team at Venture boasts of both experience as well as expertise when it comes to linear actuators. We pay thorough attention to even the minutest of the details to achieve perfection. Venture Mfg. Co. also specializes in customized linear actuators to meet the specific requirements of our clients.